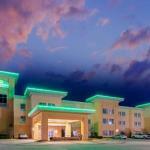 Guests are treated to free Wi-Fi and complimentary breakfast at the non-smoking La Quinta Inn & Suites Muskogee. The non-smoking three-story La Quinta is home to 69 brightly colored rooms all outfitted with free Wi-Fi 46-inch flat-panel TVs mini-fridges coffeemakers and microwaves. Breakfast is complimentary each morning. Road warriors get work done in the business center. The workout room meanwhile caters to fitness-minded folk. Practical perks include a guest laundry free parking and a 24-hour front desk. Small dogs are allowed at no extra cost. La Quinta is on Highway 69. It's less than three miles from central Muskogee where you'll find the Oklahoma Music Hall of Fame and Three Rivers Museum. History buffs check out the USS Batfish 15 minutes away and the Five Civilized Tribes Museum a mile from the hotel. Tulsa a 50-minute drive offers the Philbrook Museum of Art the BOK Center and the Tulsa Zoo. Tulsa International Airport is 46 miles away.